Red Hong Yi shares with us her journey to success, which includes the use of chopsticks, basketballs, coffee stains and most importantly, YouTube. Following our highlights on talents in different fields of art including the Queen of Jazz Pop, Dato’ Sheila Majid, we take a turn to look at a new form of creativity, where painters no longer paint with brushes. Who better to talk to about this form of new art than Red Hong Yi, an artist who has risen to the top with her innovative craftsmanship? The Malaysian born and Shanghai based artist Hong Yi, or more commonly known as Red (derived from her Chinese name ‘Hong’), never thought she would see the day, where art enthusiasts around the world covet her art. As one who started off as an architect working in one of the most prestigious firms in Shanghai, her creation of art had always been limited to the weekends. But that did not deter her from making the most out of her artsy weekends. During these period, she always made it a point to document her endeavours through photography and this had slowly and unknowingly lead to her breakout to the international stage. So, she decided to create something fun and unique that sets her apart from from everyone else. 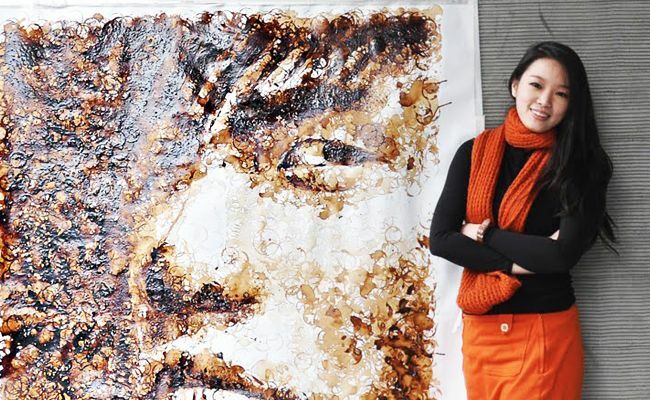 The thought led to using unconventional materials that relates to the subject she is painting.One of her first pieces was a portrait of internationally renowned artist Ai Wei Wei, which was created using 7 kilograms of sunflower seeds in an obscure back alley of Shanghai. Hong Yi explains, "It was my first 'brushless' project that I made as a tribute to his porcelain sunflower seeds installation." When she created the sunflower seed portrait, she had attracted much attention among the locals in the area and that had slowly built up to something bigger when she decided to share her work to the world via social media. In January 2012, she uploaded a short video that showed her entire work process to YouTube. That particular piece was a portrait of iconic Asian basketball player Yao Ming where she painted with a basketball instead of a brush and it had shot her to international fame. Since then, the video has garnered over 1 million views and has been shared across multiple media platforms across the globe from blogs, newspapers to magazines and social media. Now, she has opened up a studio in Shanghai for her operations with a small production team, while maintaining her job as an architect. Through her Instagram account (@redhongyi), Facebook and website, Hong Yi has managed to showcase her work to the four corners of the world and garnered a list of collaborations with iconic personalities and gallery curators. One of her latest feat is the collaboration with world-renowned Hollywood actor Jackie Chan. In the course of 1.5 months and up to 12 hours a day (totaling up to 540 hours), Hong Yi created a masterpiece by stringing 64 thousand wooden chopsticks and hanging them on a metal frame to create a portrait of Jackie Chan to mark his 60th birthday. As an artist, Hong Yi is never one who sits and waits for inspiration to come to her. She is always actively searching and creating pieces no matter where she is. If there is no time or space to create her larger works, she dabbles into smaller art forms that she shares with her fans via social media. Some of the most noted works on her Instagram include pieces made with food, makeup and flowers. With that strong belief, she continues to aim higher and create better works to inspire her fans and hopefully a new generation of creative artist that can break down the conventions of traditional art, just like herself.